This magazine, published by Movie Realm, is nothing more than a collection of photographs of the bands featured in the film. Also included is a brief write up by Joe Massot, the man behind the film, plus a few audience photographs. 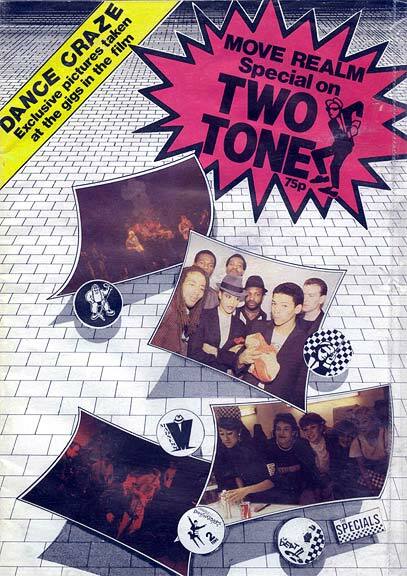 The photographs of the fans kitted out in the likes of Harringtons and braces certainly serve as a reminder that there was much more to 2 Tone than the simply the music, although it’s a shame that such images were not included in the film itself. The film was criticised at the time of its release as being rather bland, with certain band members refusing to admit to having watched it the whole way through. A few backstage interviews with band members and fans alike would have worked wonders for its appeal. The photographs contained in this magazine only serve as a reminder of a great opportunity missed. The criminal lack of text and the fact that it retailed at almost twice the price of the Garry Bushell alternative, made it far from an essential purchase at the time, but as with most 2 Tone memorabilia nowadays it is well worth picking up.